Gina Prince-Bythewood really wants to make a comic book movie, that much is clear. While she's on board for Sony's Spider-Man spinoff Silver & Black, that film is delayed and who knows where it will go. 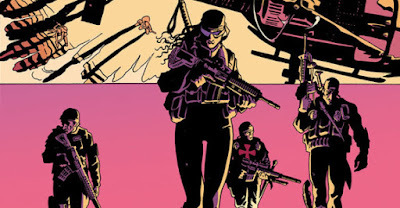 So she's decided to fill her time with a different film ripped from the funnybooks, Greg Rucka and Leandro Fernandez's The Old Guard. THR confirms (word to Omega Underground for beating them to it, tho) that Prince-Bythewood is moving forward with The Old Guard, although she's sticking around for Sony's Silver & Black. The comic centers on a group of inexplicaly immortal soldiers who work as mercenaries, until they suddenly discover another soldier just like them, a black woman in the Marines. Meanwhile a secret organization is working to expose them to the public. Prince-Bythewood's resume is pretty varied, from Love & Basketball to Beyond the Lights. But lately she's been delving deep into the comic book realm, having directed the pilot for Freeform's Marvel series, Cloak & Dagger. The plan is for The Old Guard to begin production this fall, which likely means Silver & Black will have to wait until late 2019 or 2020.